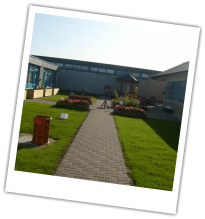 This page will bring you on a tour of St. Cronan's J.N.S. Our classrooms are spacious, comfortable and most are 'en suite'. 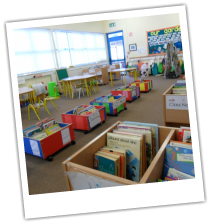 All of our classrooms are well resourced with an interactive whiteboard, musical instruments, maths equipment, full sets of library and shared reading books, musical instruments, Numicon, 'Let's Begin' programme, Letterland resources, sandpits in the junior rooms and activities for all to enjoy! We are very fortunate to have a large hall which has a stage in it. Our school has plenty of sports equipment including parachutes, beanbags, a range of balls for all sports, hurdles, balances, hoops, mats, skittles, racquets and uni-hoc sticks, equipment for sports day races, targets, goals, skipping ropes etc. We would like to say a big thank you to all the parents who have helped us fund raise over the years to buy sports equipment. 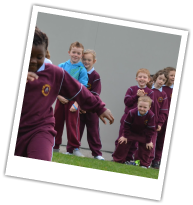 Our school has close links with Fingallians GAA club who come to the school on a weekly basis and do gaeilge football lessons with the children. 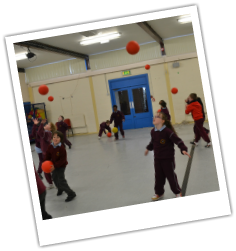 Next year we will also have Hurling lesson for the second classes. 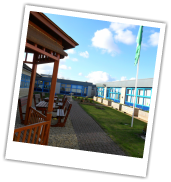 We have a beautiful garden which the children use regularly for gardening, stories in the gazebo, work on the tables, mini beast hunts and when the weather is nice, for picnics. There are six boxes in the garden that are used for the Garden Factor competition each year. 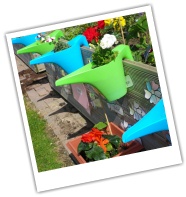 Six classes enter the competition and see who can keep their garden box full of colour for the year. 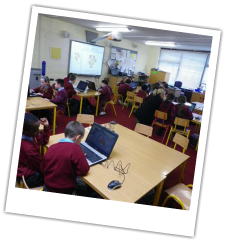 Our school places a big emphasis on ICT. 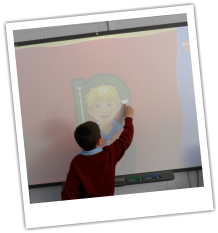 We have an interactive white board in every classroom which is loaded full of the best educational software such as Letterland, Numicon, Sherston, Numbershark, Wordshark and many more. We have a computer room which has 15 computers all with the same software and headphones. The computer room also boasts an interactive whiteboard so teachers can demonstrate to their class how to use the computers. The children go to the yard everyday for half an hour. The yard has been painted with a variety of colourful and engaging games to keep the children entertained. Each class also has the opportunity to play with activities such as goals and hula hoops on one day a week. On the 6th of March 2008, Niamh Sharkey, a well known children's author and illustrator officially opened our new school library. Our library is extremely well resourced with a collection of books in many different categories(e.g. poetry, fairy stories, Magic, Mr. Men, Animals etc). 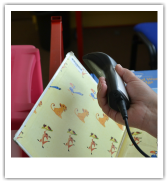 We have two listening centres, which will allow 16 children to listen to a story on headphones! 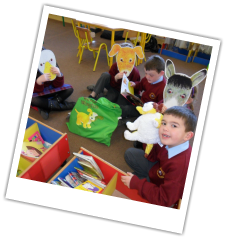 The children are allocated a time in the library each week where with the help of fantastic parent volunteers they can rent books to bring home. The children may also visit the library at other times with their teacher to get comfy on the cushions and listen to one of our hundreds of large format books or explore our story sacks.